I’m sure I’ve explained in a previous post that Newfoundland schools do not get a March Break as is the custom many other places. We get an Easter Break for a combination of reasons. One factor would be the Denominational heritage and influence remaining on the school calendar and the another is, that some years, Easter is late enough to almost seem like spring. After many weekends of combinations of coughs, company and commitments, we found ourselves free and easy this weekend. 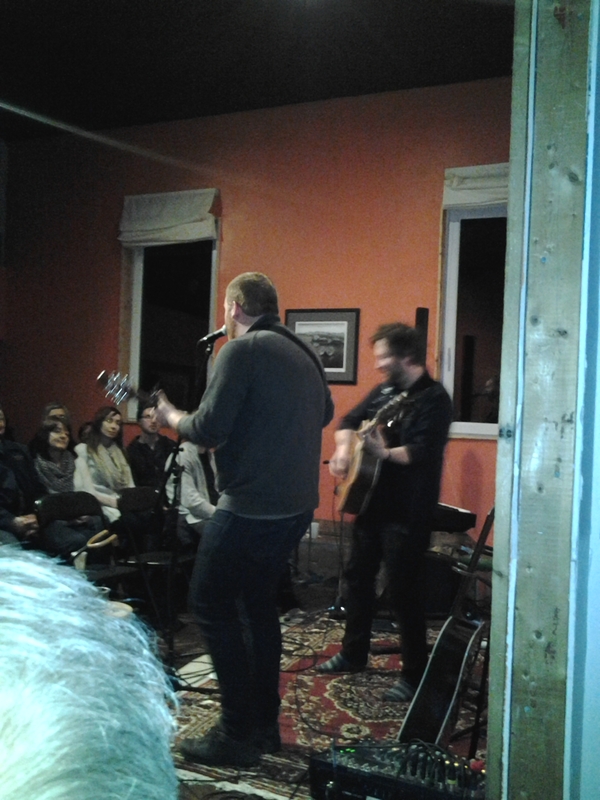 A snow day off school on Tuesday gave me the opportunity to make a couple of calls and snag the last two tickets to the Citadel House ‘s concert featuring Matthew Byrne and Sherman Downey. On a reference from friends we also got the last available room at the Islands’ Villa to avoid a dark and possibly snowy or “moosey” drive home. As much as we travel, we avoid driving at night at all costs. The cost for this night was $139 plus tax, a great deal on an amazing suite. Breakfast and coffees at the Bread Box as we formulated a plan and ran the washer. Clothes in the dryer while I packed a bag and Leo did whatever he does in the basement. 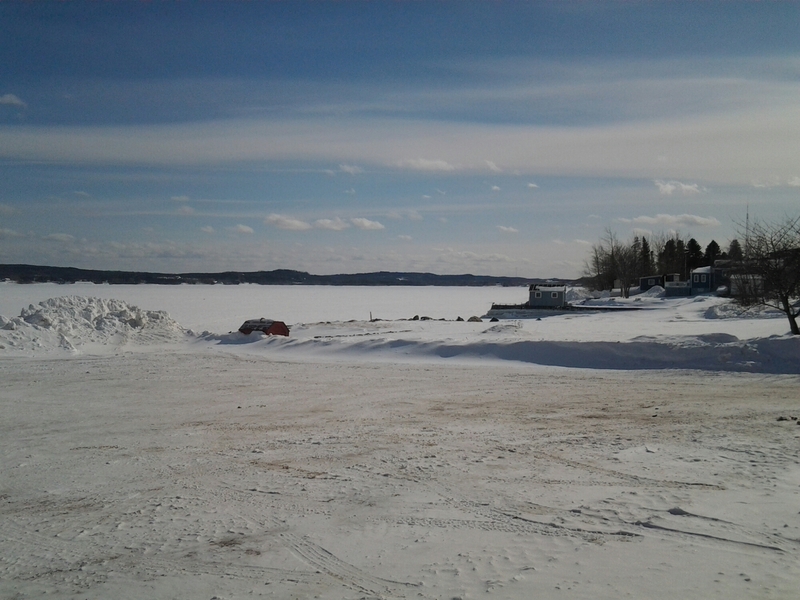 We got on the road early afternoon on Saturday for an hour’s drive to Lewisporte. 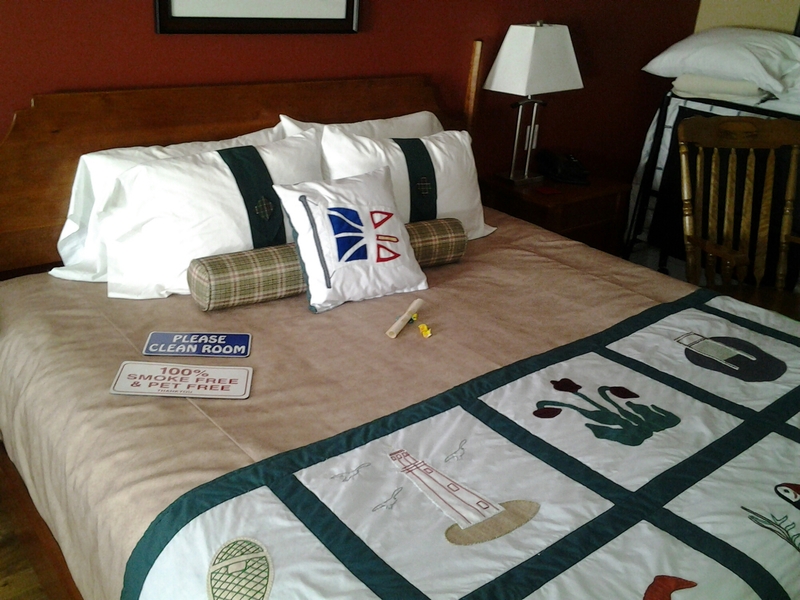 Although we’d kicked around the idea of a run to Grand Falls once we had our accommodations secured or maybe even a drive through Embree and area, once we checked out the Change Islands Suite, we decided to stay closer to ‘home’ and appreciate our luck. Islands’ Villa has eight suites, each named after a local island. Sevior’s Island, Fogo Island and Exploit’s Island are just some of the important locations honored. 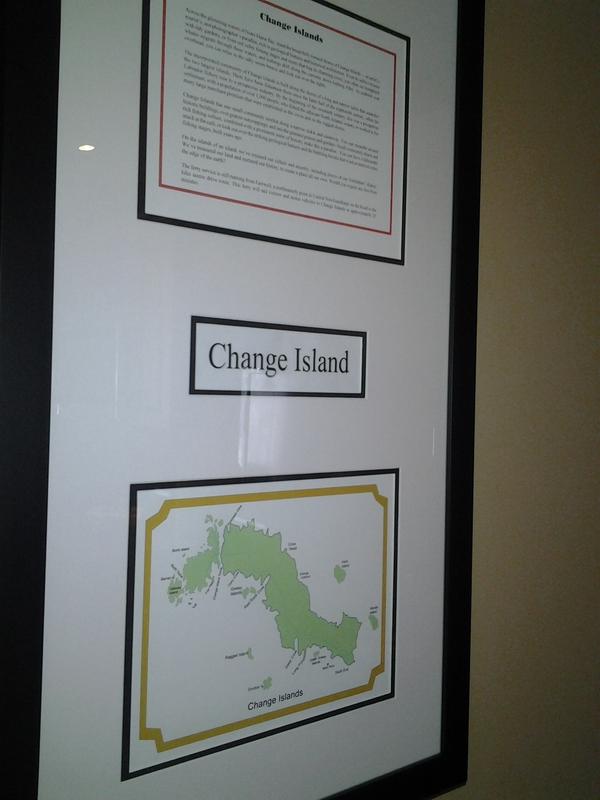 The Change Islands Room is on the ground floor facing the harbour in Lewisporte. Some quick pictures of the room before we made it look a bit too lived in and then we headed out for lunch and a stop at the mall. Living only an hour away, we don’t often land here hungry but we’d had great Chinese food at Li’s a couple of years ago. We decided to order extra to have left overs for later in the evening. I’m so glad we did. 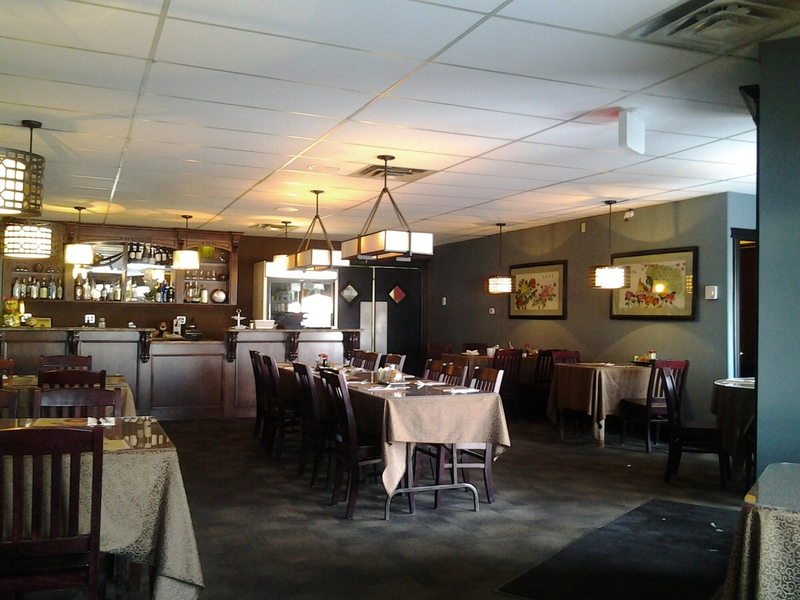 The restaurant is recently renovated and a very beautiful dining room by any standards. 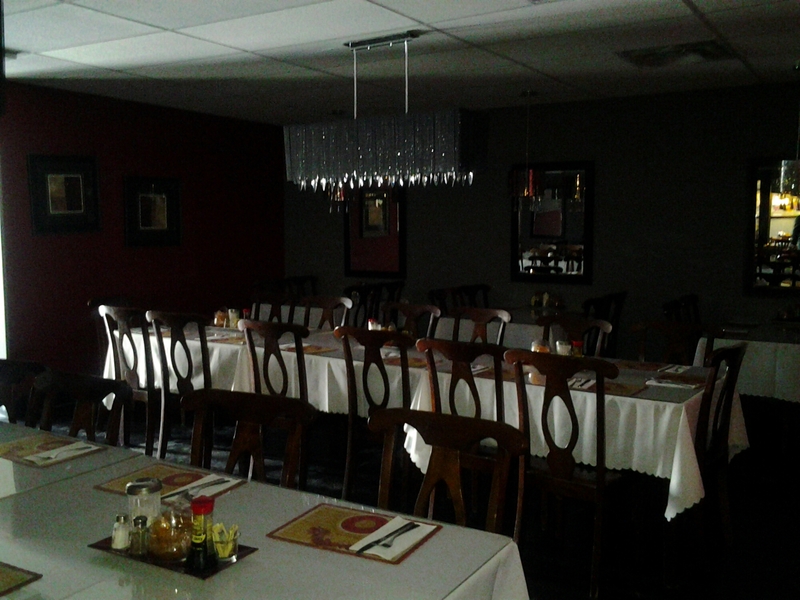 In addition to the main dining room, there is a second large room for banquets and also two smaller private rooms. 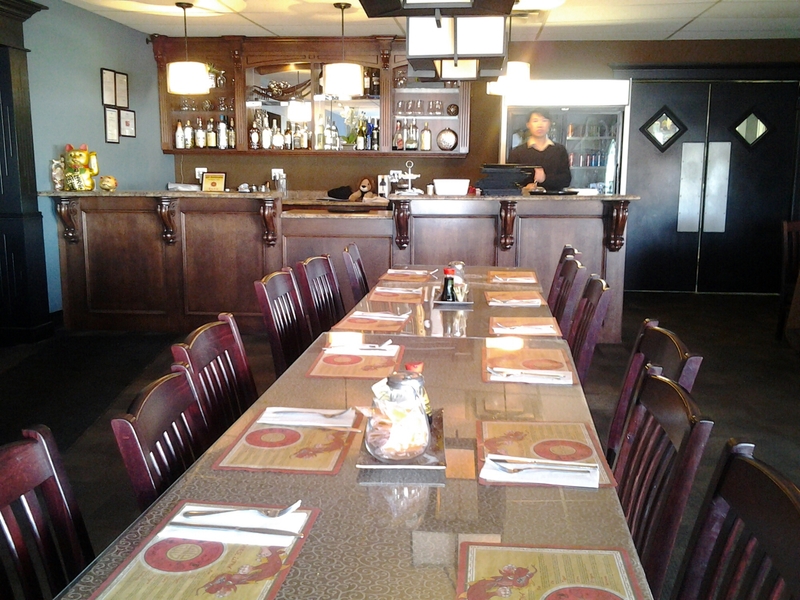 The larger private room seated around twelve to sixteen. I’m guessing it might also get booked for meetings and other functions. Our waiter was very enthusiastic with every thing we ordered indicating it was perfect or excellent. We told him we wanted enough for left overs and he assured us our four selections would be “Perfect for that”. Indeed it was. 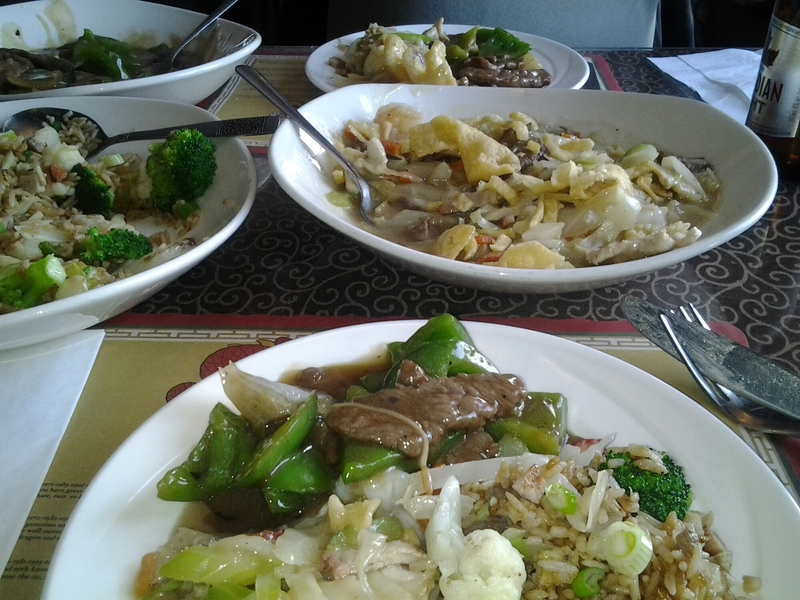 We up scaled the rice and chow mien by ordering the Li Special versions and the beef and green peppers was a great change from the beef broccoli standard. 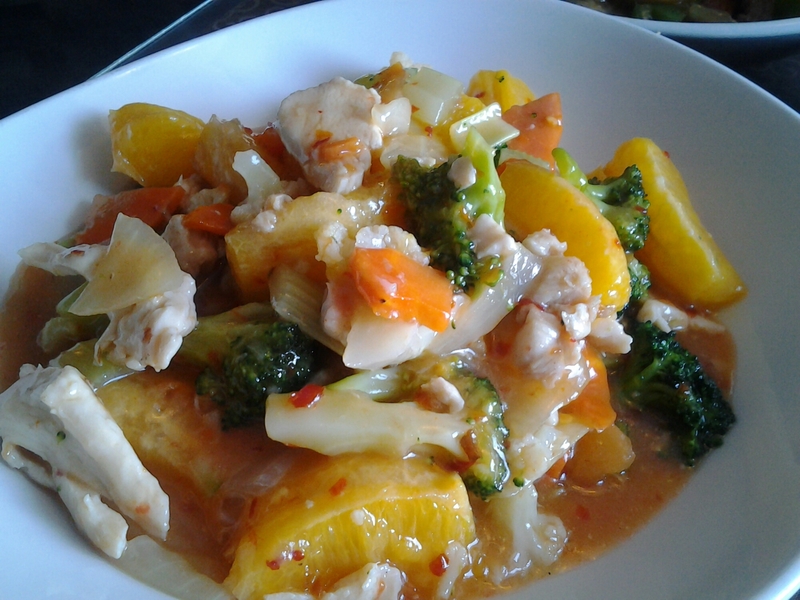 The knockout dish was the Orange Chicken. Schezuan and spicy! I highly recommend this restaurant if you are travelling. Many Newfoundland restaurants serve mostly home cooking with fries and battered fish and few vegetables unless you go to higher priced dining rooms. The Chinese families who manage their own businesses in most areas of Newfoundland offer great choices with fresh vegetables and tastes. We packed up our leftovers and headed to the Lewisporte Mall for a look around. The mall is small but offers a change with a few stores different than those in Gander. We realized when we unpacked in the room we needed coffee filters. Check. Time to go ‘home’. This is a really beautiful property. 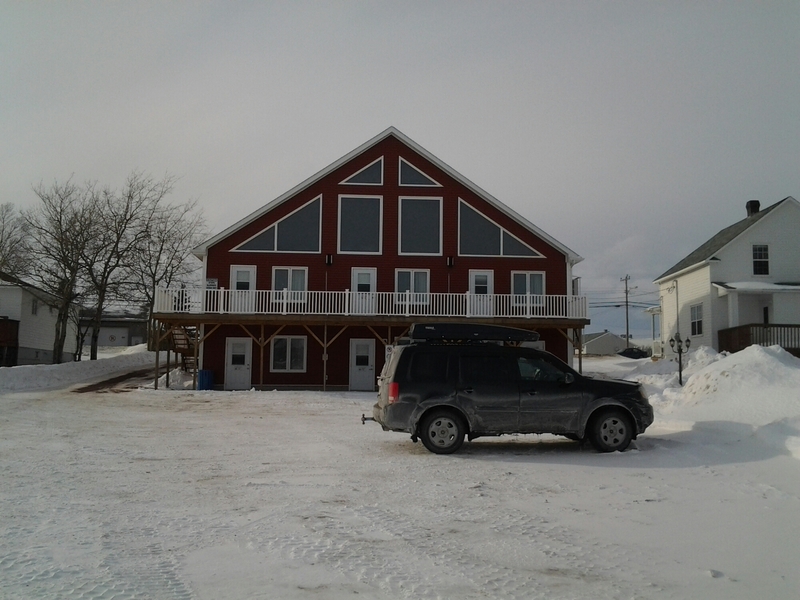 Even in the winter you can imagine the great view of the Lewisporte harbour and Marina. Although it’s been open for four years, everything looked brand new. 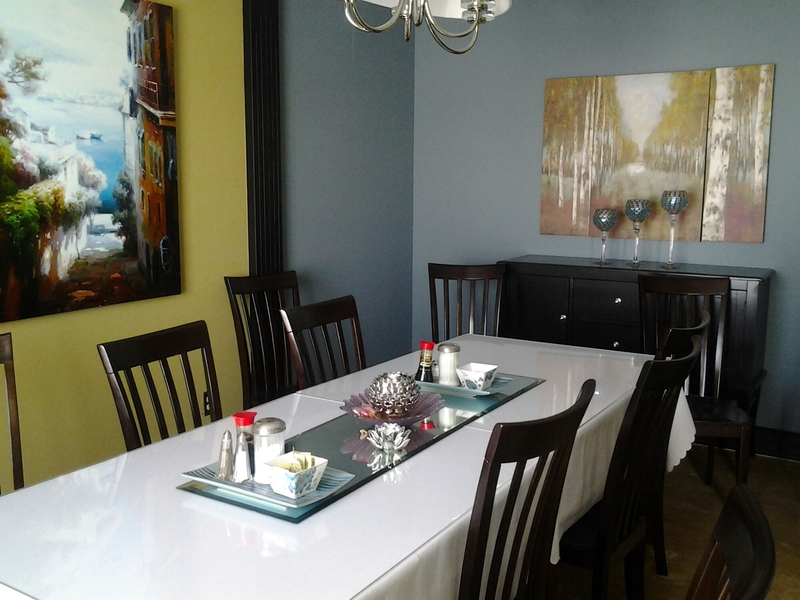 The construction and design were well executed and detailed. 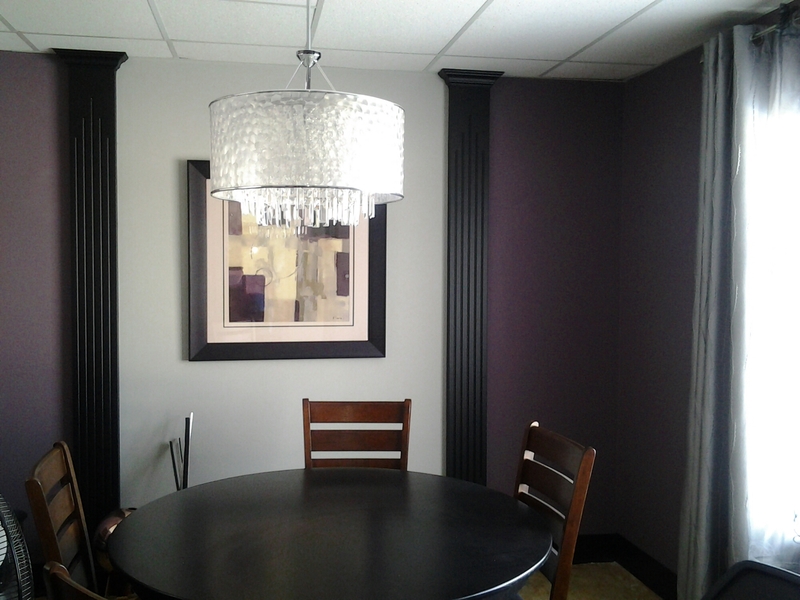 Nice mouldings and trims. Pot lights, overhead fixtures and lamps were all well places for the various uses of the rooms. We had a bathroom that was over 14 feet by 8 feet in area. There’s a lot of time to count tiles in a big old corner tub! 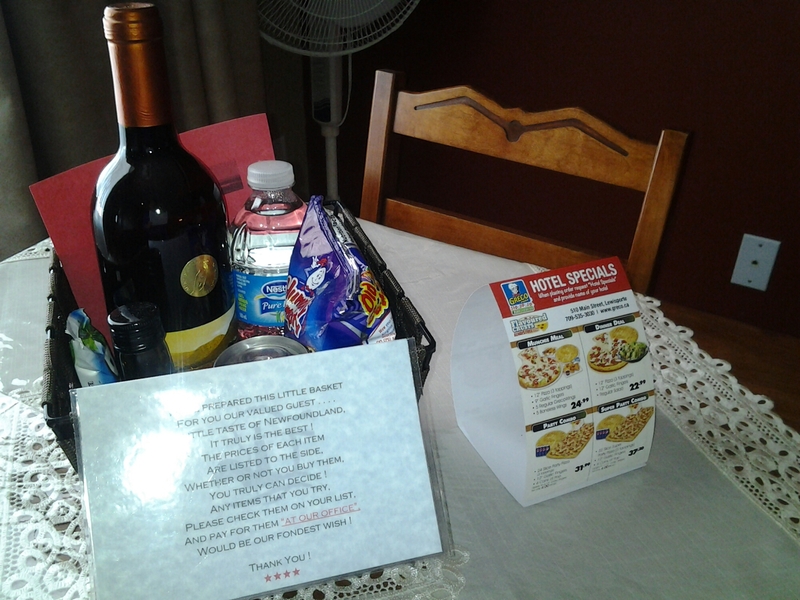 There was even an honor system basket with snacks and a selection of local wines made at Auk Winery in Twillingate. We had brought everything we wanted but prices were reasonable and the selection was good. Supper a small combination leftover plate before heading out to the concert. I’d heard the Stairs family at Citadel House were known for their hospitality and treats with coffee so we were curious to check the situation out so saved room for dessert. Dean and Stevie Stairs live in the former Salvation Army citadel where they raise their children. The Citadel House is a place “where music comes to be heard” according to their web page. 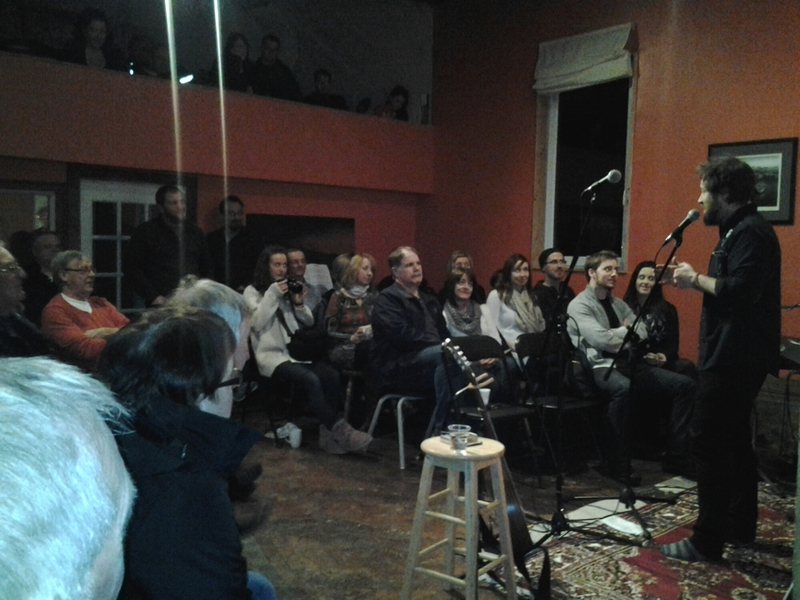 In addition to the family home, there is a recording studio and a listening room where intimate concerts are held. We were met at the door by Dean and then quickly greeted by his wife Stevie who recognized us as newcomers. We met their young son Sammy and at least three of his sisters. I had met one of their elder sons years ago when he came to my classroom as a young teen and spoke to my Grade Three students about his experiences in the sugar bush in New Brunswick with his grandfather. Riley arrived with an amazing presentations including a maple stump, containers to show the relationship between the amount of sap needed to make a container of syrup and even coloured hand outs for my students showing the process from tapping the trees to eating syrup. All grown up, he is now a piano technician. As we chatted we realized we had also met two of the older Stairs daughters on Fogo Island last summer. The sisters worked at the Flat Earth Coffee Outpost in Shoal Bay and we saw them a number of times during out visits to Fogo Island. Stairs family “taking over the world, one step at a time.” according to one of the little sisters at the Citadel House. 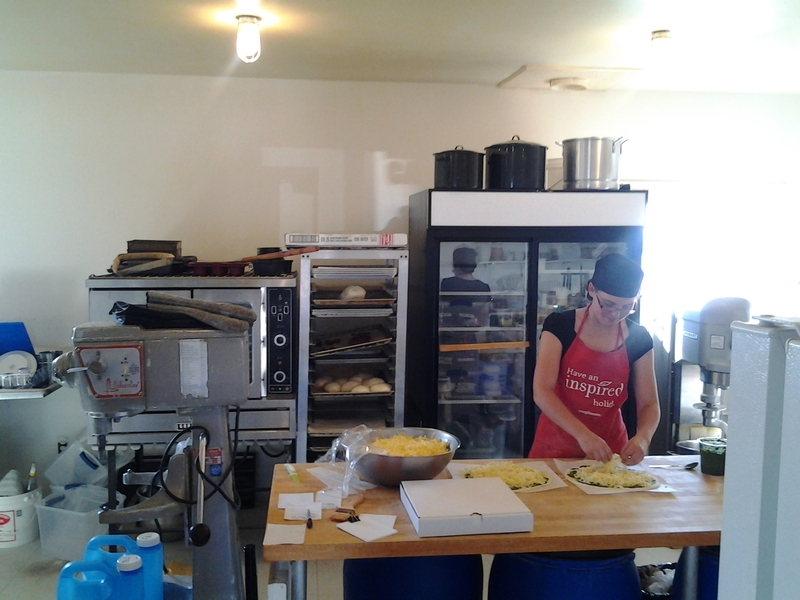 Working at Flat Earth Outpost summer 2014 making a delicious pizza. 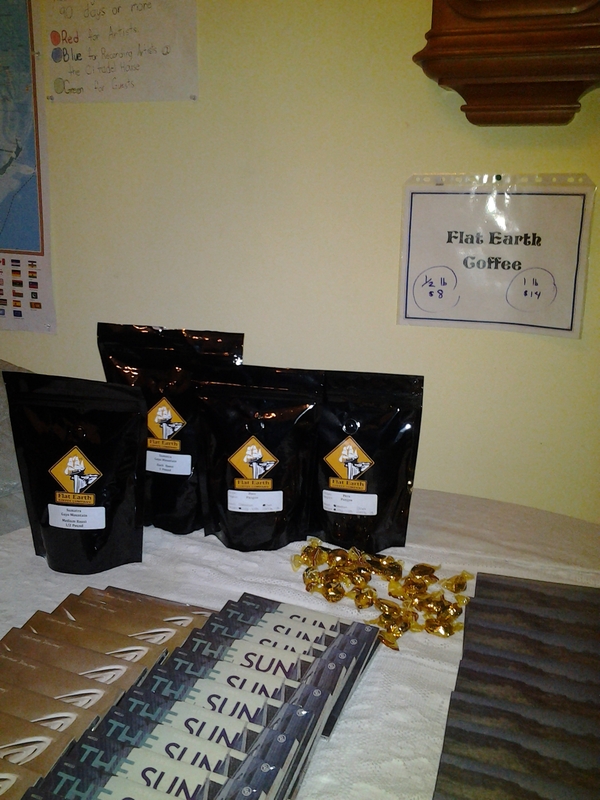 True to their reputation, the Citadel House welcomes ticket holders with great Flat Earth coffee and homemade treats. We met friends from Gander and even one of my Grade Four students was in attendance with a friend. The audience was seated on a collection of chairs and there was a balcony with extra chairs and couches. Sammy let us in on the family secret that it was the first night of couches in the balcony and that his sisters helped lift them over the rail from the performance floor. We also found out he’s playing guitar and learning drums and violin but has a tendency towards fiddle music. He was a lovely little host. All of this is just the lead up folks. Dean Stairs welcomed the house and introduced Sherman and Matthew. We’ve been enjoying the music of Matthew Byrne for a number of years after first hearing him play at the March Hare in Gander. He’s from a very musically talented lineage. We’ve been fans of Pat and Joe Byrne’s album with Baxter Wareham for years. Towards the Sunset is a must buy, must hear album. Featuring songs about Placentia Bay and resettlement, Towards the Sunset is a passionate listen. The second generation, Matthew Byrne now has his own cds, the first solo CD simply called Ballads. I love the music but also Matthew’s voice and arrangements. 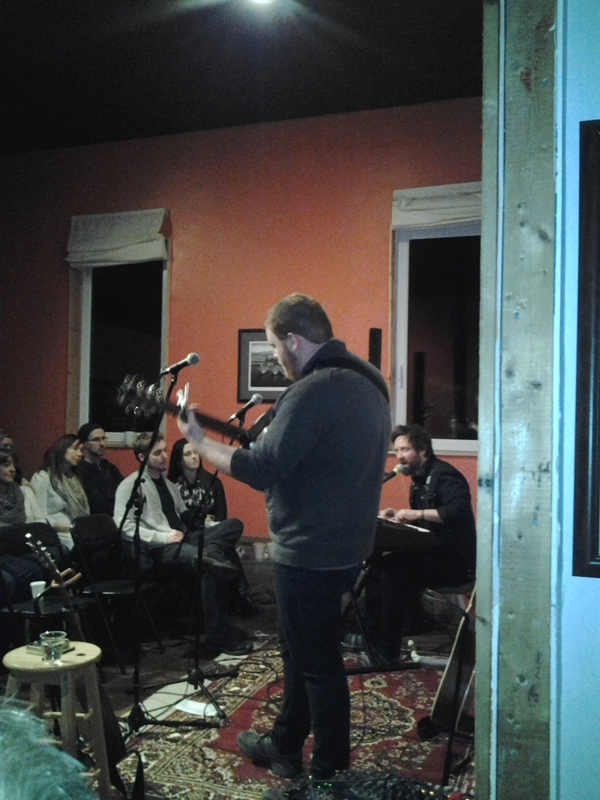 I was here to hear Matthew Byrne and get his second CD, Hearts and Heros. I’m not sure how many days the boys had been on the road at this point but I think their Bonavista show was stormed out on Tuesday, I know they played Gander on Thursday and Tilting, Fogo Island on Friday. This was Saturday and they were still full of energy and making beautiful music together. As I draft this on Sunday night, they are playing the Holiday Inn in Stephenville, I think and the tour runs until March 20. 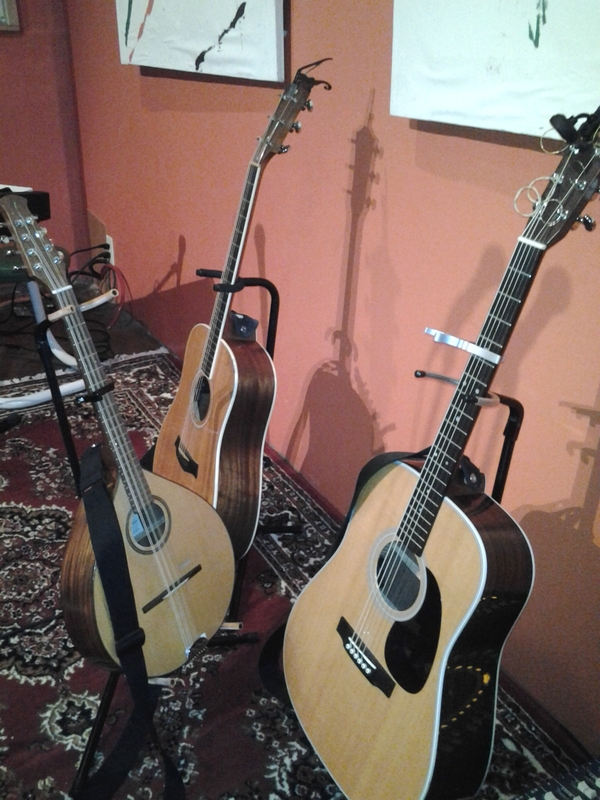 Both musicians shared stories of family and song writing and song finding. 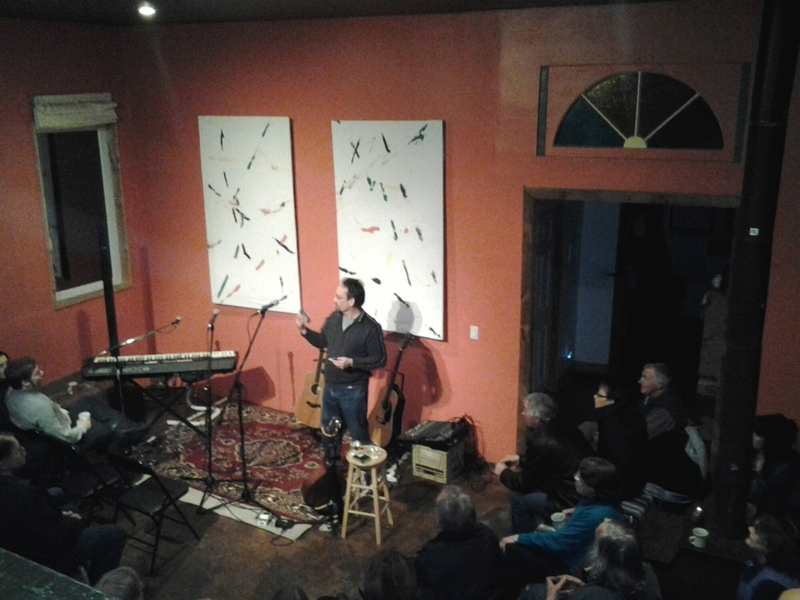 Matthew spoke of his mother and grandmother’s talents and knowledge of music. He sang a song his grandmother had sung. Even on my first generation Samsung tablet, you can get a hint of the talent of these musicians and amazing sound of this venue. We’d heard of Sherman Downey. I even knew he played one of Shaun Majumder’s Gathering Festival and his band is called the Ambiguous Case. He’s been prominent in the Newfoundland music scene for a number of years but for some reason, we did not know his music. Hearing that this tour took him to many communities he had never previous visited, I figure he can’t hold it against us. There’s a lot to know in the Newfoundland music scene just as there are a lot of roads to travel in the province. When we know better, we do better, Sherman. We know better now! A great song writer and singer he moved back and forth from piano to guitar, lead on his own songs to back up for Matthew and , a cup of tea in hand, sang a song recorded by Matthew before he in turn sang a song written by Sherman. These guys play well with others as we say in the teacher trade. 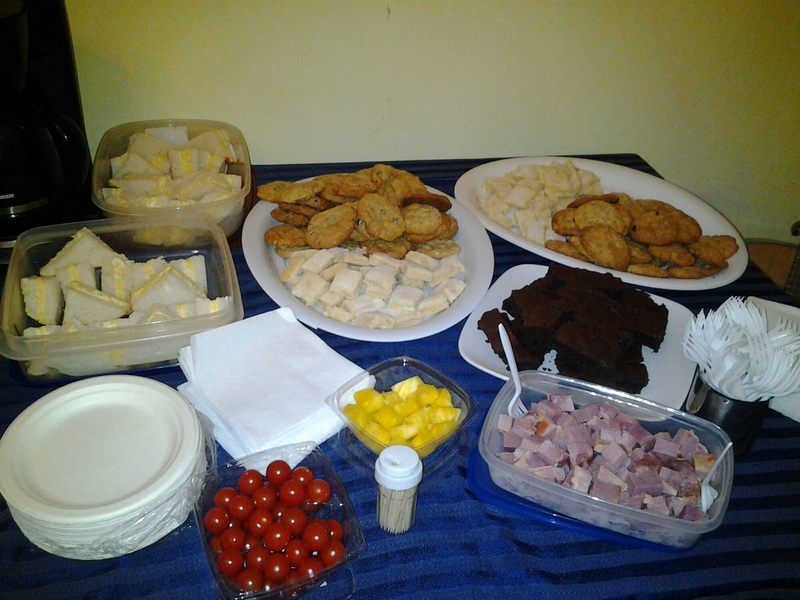 The audience ate it up along with the brownies and egg salad sandwiches. I can’t write well enough to describe the music experienced last night. My lovely Samsung Galaxy Tablet continues to try hard three year into this blog adventure but is no Dean Stairs when it comes to recording music. Here is a song written by Sherman Downey about his parents and thoroughly enjoyed by Sammy Stairs as well as the rest of the audience. I’m sorry I don’t have the title, it wasn’t on either of the CDs I bought. I think it’s called It’s good to have a Friend. I had filmed it but found a version on Youtube that shows off their talents much better. Both musicians are very comfortable performers. Fun family stories were shared and I can only imagine how many more will come out as the tour goes on. Sherman told us about a car he and his dad are restoring together and how if his father finds out the won the lottery he’s paying someone to finish his half of the father/son bonding project. Check out this concert series as it heads West and then swings through again to finish in St. John’s. Details are on the link below or on their Winter Island Tour facebook page. This was a wonderful getaway. Great food, music and atmosphere. Happy smiling people from the lady at the Villa to the audience at the concert. A great day for a drive had us watching for snowmobile and moose tracks as we drove to Grand Falls. Home by 5:00 with groceries, three new CDs and enough left over Chinese food for one last supper. There’ll be lot of Honey for Bees and you’ll have The Sun in your Eyes! 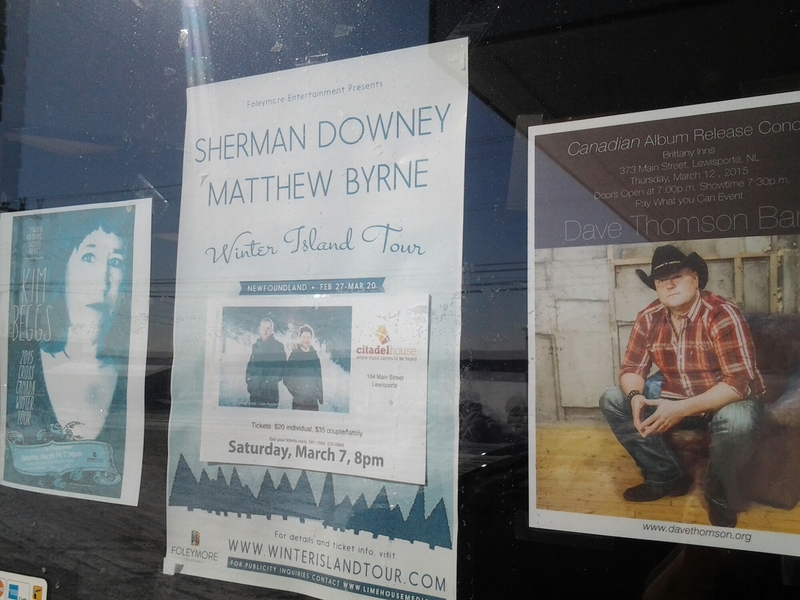 Check out the local entertainment venues and plan a trip around a play or a concert and if you are viewing this post in March 2015, here are the upcoming dates for the Winter Island Tour by Matthew and Sherman. Go see them and if you have to, travel! There are great places to stay in all of these communities. If you’re in the Lewisporte and Central area, watch for posters of upcoming Citadel House concerts.